UNS – Universitas Sebelas Maret (UNS) Surakarta gained achievements in an international competition. 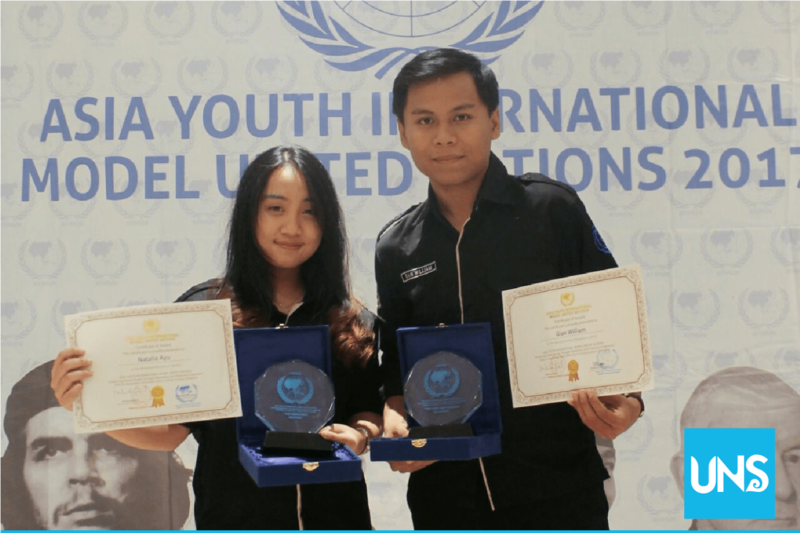 Two students of UNS Law Faculty won the title in the Asia Youth International Model United Nations (AYIMUN) competition held by Indonesia Global Network in Kuala Lumpur, Malaysia (3-6/11/2017). AYIMUN is a Model United Nations (MUN) competition consisting of 7 councils, namely ARF, UNESCO, UNHR, OIC, IMF, and Press Corps. The two outstanding UNS students were Natalia Ayu and Gian William. Natalia gained the Honorable Mention from the UNESCO committee, while Gian succeeded in grabbing The Most Outsanding Delegate from UNHCR. The UNESCO Council was followed by 167 delegates, and UNHCR was followed by 98 delegates from all over the world. Natalia explained that the Model United Nations is an academic simulation combining the rules, procedures, and workflow of the UN. AYIMUN itself aimed to provide a platform for future young diplomats to encourage understanding of international issues and policies and debating and sharing perspectives between participants from different backgrounds and ethnicities. Furthermore, Natalia said there were many experiences gained during the AYIMUN 2017 such as how to diplomate, debate, and make a good resolution as it is commonly done by the UN organs. According to her, there are still many issues that do not get attention from the public.